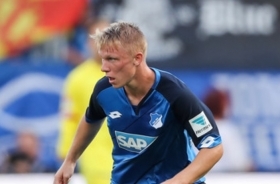 Hoffenheim younger Philipp Ochs, 20, is a product of his club's excellent youth academy which has brought through dozens of talented young players in recent years. The 5 foot 8 winger has in recent times forced his way into Hoffeinheim's first team. A free scoring winger, Ochs brings devastating pace and excellent ball control to his team and has impressed at every single international youth level. Ochs has appeared for the under-15's of Germany right the way through to the under-20's. Ochs has an impressive return in his international games, with 45 games played and 19 goals scored so far. For Hoffenheim's full team he has now played almost 20 times, scoring two goals. According to reports from Germany recently, Ochs has been monitored by Bundesliga duo Bayern Munich and Borussia Dortmund. Hoffenheim have so far rebuffed all interest in their star youngster and have indicated that the player is not for sale at any price. Ochs himself knows that if he is to make the step up to full international selection for Germany, he would need to make a move elsewhere. He has been compared to Bayern Munich star Arjen Robben and could even become an eventual replacement for the Dutchman at the Allianz Arena. Keep an eye out for the player, he will be a big player for many years to come.